This photo was taken on August 21, 2017 in Madras, Oregon. That’s me, watching as the moon moved in front of the sun to create a total solar eclipse. It’s taken me awhile to write about my experience because I had to process it for awhile to try be able to convey it adequately. By that I mean my experience viewing a total eclipse was so weird that I’ve had difficulty coming up with proper descriptive language. But let me start by sharing my appreciation for central Oregon, and in particular, the town of Bend, Oregon, where I stayed in the days leading up to the big event. For those who have never visited Bend, I highly recommend it as a tourist destination. It is a bit out of the way, in the sense that it is not accessible via a major highway like Interstate 5, or Highway 101. For those traveling north-south, you get there via Highway 97, which for the most part is one lane in each direction. If you’re coming from the south, you’ll go by Crater Lake, which is also worth a visit. I recommend visitors to Bend add a day onto their travel plans to visit Crater Lake. Bend is located on the Deschutes River and was previously a mill town for lumber harvested from Oregon’s forests. The mill has since been converted into a riverside tourist attraction that houses shops, restaurants, and breweries. There are also vendors that rent a variety of watercraft such as canoes, tubes, and paddle boards to those who want to get out on the river and float down into the center of town, where the river backs up into what is known as the Mirror Pond. It is a beautiful, bucolic setting just steps from the main commercial area. You can stroll through the downtown area and around the Mirror Pond. It’s very charming. For those who like beer, there are more than a dozen breweries in this small town, perhaps most notably the Deschutes Brewery, although locals I spoke with like the one called Boneyard Beer. I tried their IPA and it is fantastic. You can go on a tour of the breweries if that’s your thing. Other activities include river rafting, golf, fishing, and snow skiing in the winter. Mount Bachelor is right next to Bend and you can see it from town. I really can’t say enough about Bend. It is one of my favorite places to visit, which is why I stayed there for my eclipse visit. But Bend was not in the “path of totality.” In other words, you couldn’t see the total eclipse of the sun from Bend, which necessitated a short drive north to the town of Madras. In the days leading up to the eclipse I was following news reports and intel from friends in Oregon regarding the expected traffic around Madras. Some of the reports were quite breathless and predicted a traffic nightmare on the big day. The guy at the registration desk at my hotel said there was a group from Arizona that planned to leave Bend for Madras at 1:00 a.m. to ensure they were in the proper location at 10:00 a.m., when the total eclipse would occur. I decided to leave Bend at 6:00 a.m., assuming that four hours should be sufficient to travel the roughly 50 miles between Bend and Madras. As it turned out the traffic situation had been over-hyped. That’s because most of the people viewing the eclipse in Madras had arrived there a couple days early and were camping in areas set up by enterprising locals. One such area had tents and RV’s stretching out to the horizon. Another over-hyped story was that the police and the Oregon National Guard would not allow people who were traveling in their cars when the total eclipse occurred to simply pull over to the side of the road to view it. You were supposed to have a pre-determined location for viewing that was other than the road shoulder. I had worked this part out in advance with my Oregon friends and our pre-determined viewing location was on someone’s property just off Highway 97. We arrived at our viewing spot at around 7:00 a.m. and then just waited there for the eclipse. Oh well. Better safe than sorry. As for the total eclipse experience? It was the most amazing natural phenomenon I’ve ever witnessed. You have to wear the glasses as the moon is passing in front of the sun and all you can see is the moon, which shows up as black, slowly moving over the sun, which shows up as a red crescent. The crescent slowly diminishes to a sliver of a crescent as the moon moves in front of the sun. Then, the sliver disappears and all you can see through the glasses is black. In the news reports leading up to the eclipse there was a lot of conflicting information about the appropriate eye wear to use so as to avoid permanent damage to the retina. Some reports said “never look directly at the sun without the glasses.” Others said it was OK to look at the eclipse once it had reached totality. I’m not an optometrist, but I can say from my personal experience that you can definitely look at the eclipse once it reaches totality, though I should say that was my personal experience. I looked right at it and suffered no discernible damage to my eyes. So, I was in a field with about 100 other people from all over the world. There was a couple from Scotland; some people from Australia; a party from Mexico, etc. There were also quite a few locals and cars with California and Washington plates. We were all looking at the event through our glasses until all we could see was black, which meant the event had reached totality. Then, we all took our glasses off at the same time. Everyone had a verbal reaction to the totality. There was a lot of “oh my God,” along with several “that’s incredible.” Also, “that’s awesome!” There were also quite a few people who uttered a wordless, guttural sound like “gah!” Then, there was what I’ve come to call the “paleo” response. Namely, there were about five people who looked at the totality and screamed. And folks, it wasn’t a scream of excitement, like you might get when a rollercoaster drops from it’s apex. It was a scream of fear: a high pitched shriek of shock and disbelief. I’ve thought quite a bit about this fear response. I can’t believe the people who reacted that way didn’t know, on a scientific level, what was occurring. It’s just that the experience is so…weird, that it bypasses your intellect and hits you on a primal level; something deep and elemental that goes back to caveman days. It made me think about what the reaction was back in the days when people didn’t know, on a scientific level, what was occurring. When I took off the glasses and looked at the totality I saw a black hole in the sky, with globular light pulsating around the edge. It was a frightening visage, indeed. Also, the ambient light was eerie; not quite like nighttime and not quite like dusk. The effect was similar to what you might see on a cloudless night with a full moon, but it wasn’t quite like that either. As you can see, I’m still struggling with proper descriptive language. I’ve concluded that the problem is that the experience is beyond written description. Photos don’t cover it either. For example, a photo would’t convey the fact that the temperature dropped about 25 degrees (F). It was about 78 degrees just prior to the eclipse, but as the moon moved in front of the sun the temperature dropped quickly, which is why in the photo I’m wearing my Pendleton shirt. I was so impressed with the total eclipse that I am seriously considering taking a trip to Argentina for the next one, which occurs on July 2, 2019. If you don’t want to travel that far, the next one in the United States is on April 28, 2024. The path of totality goes from Mazatlan Mexico through Maine. The trick will be finding a location where there is the least likelihood of cloud cover, which would ruin the experience. I’m thinking southwest Texas, near the Mexican border, might be a good spot for that one. 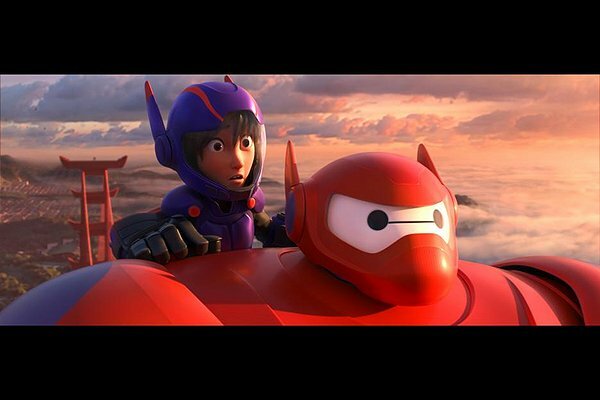 I just saw the new film Big Hero Six, co-directed by Don Hall and Chris Williams. It is a fairly satisfying animated family film the likes of which you would expect from Disney studios. There were a lot of young kids in attendance. If you have young children that you want to see the film with you needn’t worry about any objectionable material. In fact, one of the best aspects of the film is it’s promotion of science and technology as something fun and adventurous. There will be a few kids who will see the film and become inspired to study the sciences. The film is imaginative and humorous. To me, it seemed like a mash-up of Japanese anime and an episode of Scooby Doo. Even the fictional locale is a mash-up. The animation is bright, cheerful, busy, and evocative of anime. The film jumps right off the screen with heavily saturated colors and a 3D feel, though it is not actually 3D. A boy named Hero is entering puberty as he’s thrown into a conflict involving robots, a science professor, and a tech sector industrialist. The plot definitely reminded me of a Scooby Doo episode, with a group of friends working together to battle a villain. The best part of the film is the main robot character, who is given all the good lines and creates the most humorous elements. Humor is definitely the biggest emotional component, though the directors try mightily to tug the heart strings as well. I would say that if there’s one place where the film falls flat is in that department. It never achieves the emotional heft of a film like Pixar’s Up, or Toy Story 3. That said, it’s an enjoyable family film that will please adults as well as it’s target audience. 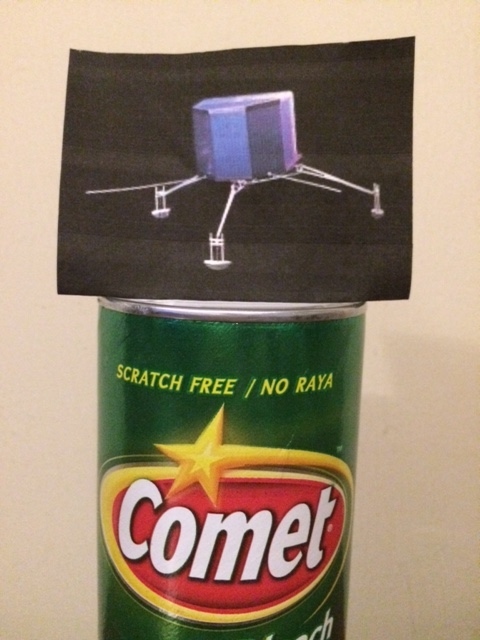 You may have heard that the European Space Agency landed a spacecraft on a comet today. Enough has been written (already!) about the historic event, so I’m going meta and talking about what it means to me. I was very young when NASA put humans on the moon for the first time, but I still remember it. That event did three things to me. First, it expanded my understanding of the world. I understood that we live on an isolated, but interconnected world. Second, it made me wonder if there are other worlds out there that might support life. Most importantly, even at an early age, I was able to realize that the people who live on Earth are in the same lifeboat and that we share common interests; and in that moment I realized that human interactions across governmental and cultural divides are less important than our common human experience. The event was also the genesis of my interest in science fiction novels, and afterwards I spent my childhood reading the science fiction canon. Now, let’s connect my memories to contemporary reality. There are people who are trudging through the deserts of Syria and Iraq engaged in behavior reminiscent of the 15th century. It’s horrible, and I can’t understand how we, as humans, have been unable to move forward together as humanity to realize a more hopeful future. Perhaps this achievement will inspire young people to have the same epiphanies I had when I was their age. By the way, the photo in this post is not intended to denigrate or be dismissive of the magnitude of this incredible, historic achievement. I just think that humor is a great way to engage people on the front end into what is a profound and important discussion.